The last meeting between these two sides was seismic, and the reasons are twofold. Firstly, DR Congo’s historic 4-3 defeat of Ivory Coast in Abidjan last October, the Elephants’ first home competitive defeat in nine years, was pivotal in their qualification as the best third-placed team. Secondly, and most crucially for Ivory Coast, it was the final straw which ignited Herve Renard into lengthy soul-searching over a defence that was increasingly becoming inflicted with panicky disarray. The key U-turn from the Frenchman was the subsequent reintroduction of Kolo Toure, hitherto ignored under Renard’s rule as he sought to inject some fresh blood undeterred by senescence and untainted by psychological trauma, for the final group fixtures against Sierra Leone and Cameroon. Indeed, that DR Congo defeat went some way to changing the cast of the defence. Out went the domestic-based duo Franck Kessie and Christian Kwame Koffi, while the Romania-based Ousmane Viera, who partnered Kessie in the engine of the defence, now dons the CAF bib on the bench, as does Tupac doppelganger custodian Boubacar Barry. Only full-backs Serge Aurier, extremely adventurous, and Siaka Tiene, more reserved at left back, are the survivors from the defensive system that took part in that ignominious defeat. In the short-medium term, or tournament term at least, Renard’s train of thought would eventually arrive at adding an extra body in defence, transforming it into a back three, to establish some sort of sustained respectability into the defensive. Perhaps it is risky playing such an unconventional system at such short notice but, for the most part, Ivory Coast have looked more solid during this tournament than they did during any time in qualifying. And had the system been deployed without Kolo Toure, who is accustomed to the system after playing, the midpoint of the callow pair of Eric Bailly and Wilfried Kanon, it would have probably been harder to roll it out without any major glitches. Florent Ibenge’s team will feel they have the psychological edge after their momentous triumph in Abidjan. Franck Kessie may have been red-carded and they may have lost their 3-1 lead thanks to a bulldozing cameo off the bench from Salomon Kalou, who would score a late brace to pull it back to 3-3 despite the 10-man handicap, but DR Congo did win the game in the end thanks to a breakaway winner by Jeremy Bokila. The Leopards will be buoyed by the feel-good factor flowing throughout their team after their remarkable comeback against their bete noire Congo in the quarter final, their first win in the tournament. Key in that comeback, a 20-30 minute spell where we saw DR Congo at their fluid best for the first time in this tournament, was the wonderfully-named Neeskens Kebano. Bokila diagnosed the lack of a No. 10 as the reason for the incongruous, one-dimensional attack we saw in the group stages, and Kebano’s sparkling and economical entrance – a 100% passing rate, an assist and direct running were some of his virtues – may have just sneaked him into starting XI. The severe weakness is the DR Congo backline. Had they faced any of the quarter finalists but Congo in a similar scenario (two goals down), it is hard to envisage them having wriggled their way out with a win. Registering the first goal will be key for a DR Congo side that has trailed in three out of their four games in the tournament thus far, making their campaign arduous. 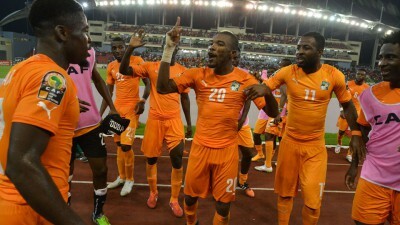 Scoring first is most logical way they can go toe-to-toe against an increasingly confident Ivory Coast team. Certainly, an early goal may see Renard abandon his 5-2-3 system, meaning DR Congo have the space to thrive in. But they must build play better from the back – even when given space, Ibenge’s side have been over-reliant on their wingers, particularly Bolasie, for creativity. When he has not produced, they have looked short of ideas. It is a context which the pragmatic Renard will relish. The defeat in Abidjan will make his side naturally cautious; they will need no reinforcement from their coach of the pitfalls of taking their eye of the ball. Because, as DR Congo showed in Abidjan and against Congo, they certainly have the firepower to punish them.